Our services of film transfer in San Diego can provide you with high quality digital copies of your 8mm film, 16mm film or Super 8 film film on DVD, Blu-Ray or DV-AVI video. This can be great as gifts, or as a way to store your family memories for years to come. The first step in a film transfer order is the cleaning and repair process. To ensure the highest quality transfer, possible, every inch of your film is cleaned and lubricated using in-house equipment. The type of cleaning we perform will depend on the age and condition of the film, and we’ve even been able to save film that’s been heavily damaged or deteriorated from vinegar syndrome. In addition to cleaning your film, our film transfer technicians will repair any broken splices and re-splice your film onto brand new 400′ reels. 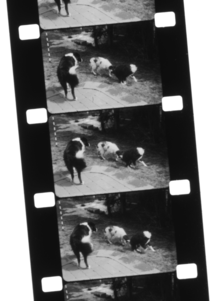 The process of inspecting and cleaning the film often takes longer than the transfer itself which is why film is a slightly longer process than transferring video to DVD. The cleaning process is something that many companies do not perform but is essential for this type of service. Once the film has been prepped, it is time to perform the film transfer. Film is projected directly into the lens of a broadcast quality 3-CCD camera which captures your film digitally on our hard drives. With our premium film transfer service, we will restore your color film scene by scene and adjust for brightness and contrast in real time as the film is being transferred on our machines. For information and pricing, please see our Film Transfer San Diego page.